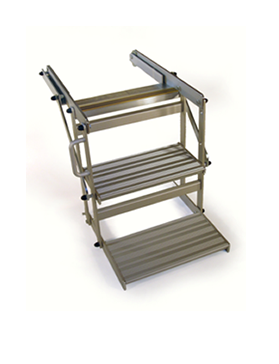 The Stayco D Series fold-out double step offers a simple alternative to an under-floor or flip-over step. In many cases it can dispense with the need to create a step well in the vehicle bodywork. 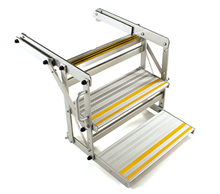 We supply several versions of this manually operated double step for side and rear door entrances. These steps are operated standing outside the vehicle. They stow fully into the vehicle clearing the closed door. There are three side door and two rear door alternatives in the series catering for different vehicle floor heights. 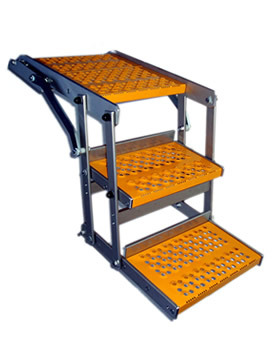 We can easily adjust the widths of these steps to accommodate specific application requirements provided alloy treads are used. We do not recommend units wider than 700mm or narrower than 420mm. ** For passenger carrying vehicles, it is important to check that there is an alternative means of escape other than the doorway to which the step is fitted. In most cases this will be the rear barn doors of the vehicle. 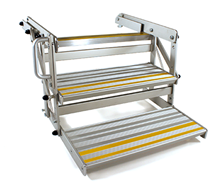 However if the exit is blocked, for example, with a centrally mounted wheel chair loading ramp, these steps cannot be fitted.